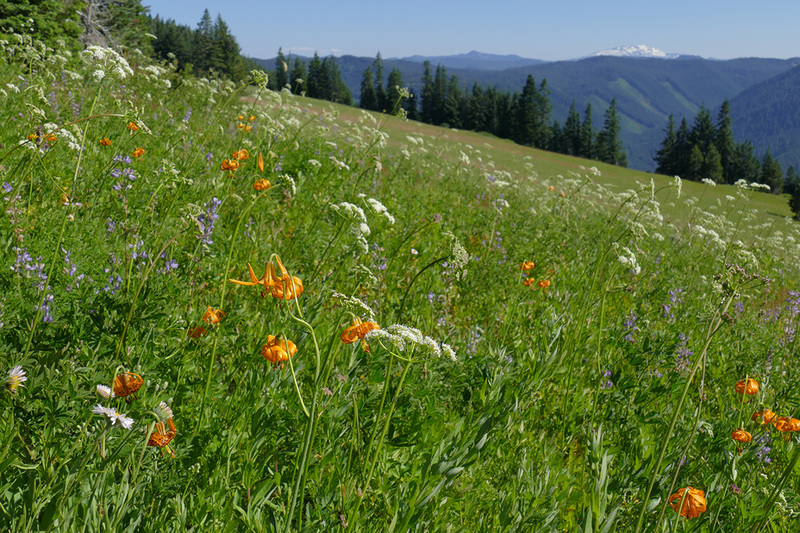 On July 21, I went for a hike at Grasshopper Meadows. 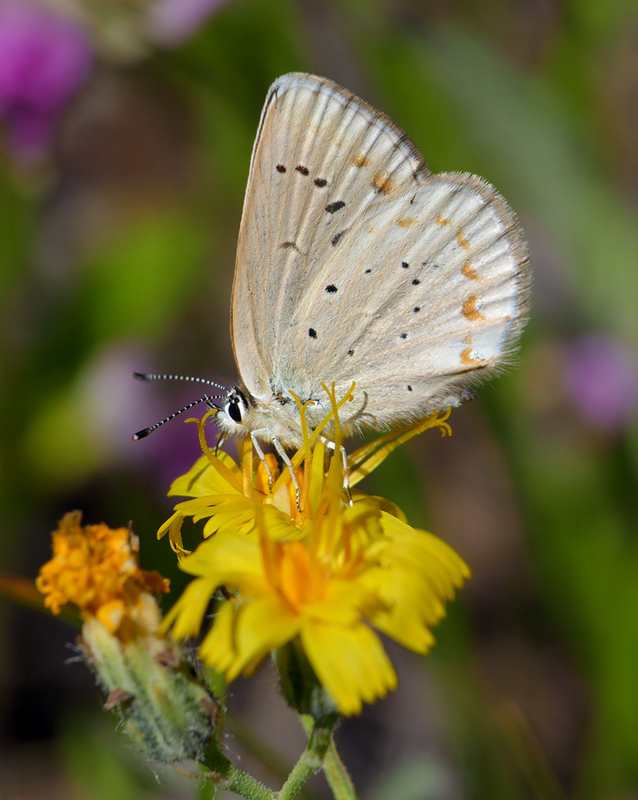 I figured there would still be some meadow flowers in bloom and plenty of butterflies. My first surprise was seeing another car as I arrived at the trailhead and finding it was fellow Native Plant Society of Oregon member and friend Rob Castleberry and his wife Joyce and their dog Wiley, who had arrived just minutes before me. We were able to walk together across the meadow to edge of the cliffs. On the way, we were surprised by a family of grouse bursting out of the grass in front of us. Joyce wasn’t up to the bushwhack down through the woods to the bottom of the cliff, but Rob joined me. It’s always a pleasure to share one of my favorite off-trail spots. It was too bad Joyce couldn’t come down, but I was happy she didn’t mind being left on her own for a little while. After Rob headed back up, I stayed behind and collected seeds for a while. I’m trying to get back to adding seed scans to the gallery on this website, as well as collecting seeds for my garden and property. The beautiful shooting star (Dodecatheon pulchellum) seeds were ripe as were those of the leafy fleabane (Erigeron foliosus). I have one leafy fleabane plant in my rock garden that was grown from tossing seed around, so I thought I might try it in a rocky area in my meadow that I’m trying to restore. My favorite Merriam’s alumroot (Heuchera merriamii) was still in bloom on the cliffs, but most everything else was fading or completely done down in this hot, rocky area. I must have been down there longer than I thought because when I returned to the top of the cliff and “trail” (such as it is), Rob, Joyce, and Wiley were just returning from having walked the rest of the trail across the top of the meadow and back. I was glad to get a chance to say good bye. A bizarre form of Cascade lily with green and pink flowers! Rob told me they’d just seen a blooming Cascade lily (Lilium washingtonianum), so I kept my eyes open for that. Not only was there a lovely blooming plant with the typical flowers that are white fading to pink, but there was an extremely odd plant nearby that just had to be another Cascade lily. However, this plant was more congested and had deep purple leaves topped with flowers that were green with deep pink on the tips! Lily flowers are made up of six tepals—undifferentiated sepals and petals. While they are usually showy like petals, on rare occasions they seem to get mixed up and all look more like sepals. I’ve seen this once in a western trillium (Trillium ovatum) that had odd, green flowers. Plants in the lily family also seem to me to more frequently have abnormal flowers than those of other families. It was here at Grasshopper Meadows almost 9 years ago to the day that I spotted a fully double mountain cat’s ear (Calochortus subalpinus). I’ve looked for that plant ever since, but this year’s drought had moved things forward, so the cat’s ears were mostly finished blooming. 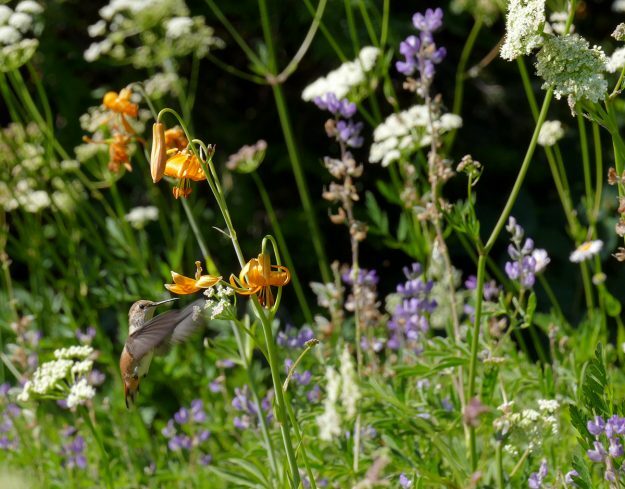 A rufous hummingbird drinking from tiger lilies is a wonderful sight. I continued up through the meadow, trying to take photos of all the butterflies nectaring on abundant late-blooming Scouler’s hawkweed (Hieracium scouleri) and Alice’s fleabane (Erigeron aliceae). Parry’s arnica (Arnica parryi) and pink owl’s clover (Orthocarpus imbricatus) were also in full bloom but not as enticing to the pollinators. 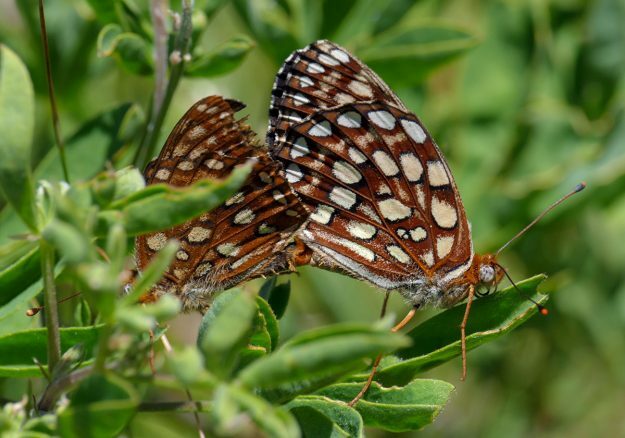 In addition to numerous fritillaries, there were also checkerspots, parnassians, blues, and coppers. Sneaking up on the butterflies was difficult because large numbers of grasshoppers leapt in front of my every step, scaring off the butterflies I was trying to photograph. All the “distractions” made my pace very slow, but I was really enjoying myself. Along the top of the meadow, where the snow usually lasts longer, I came to an especially floriferous spot. 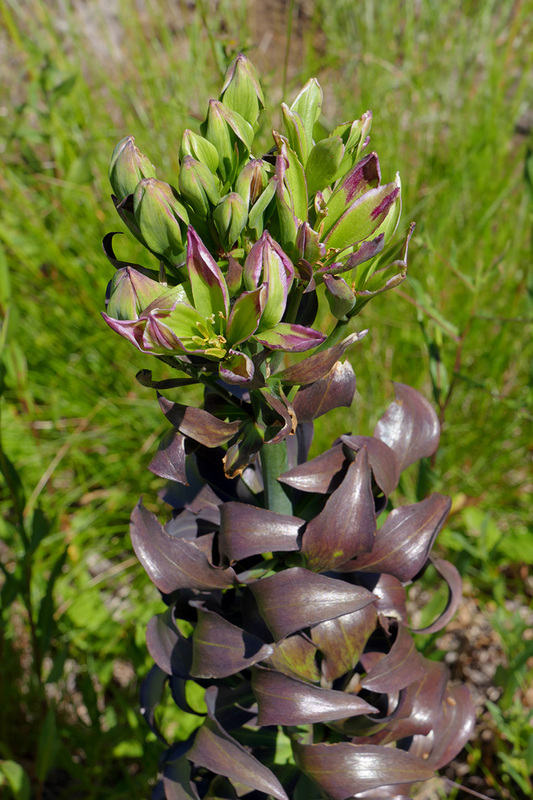 It was filled with lilies (Lilium columbianum), lupines (Lupinus latifolius), and lovage (Ligusticum apiifolium). In addition to butterflies, a rufous hummingbird or two were enjoying the abundant blossoms. I spent quite a while trying to get photographs of the hummers and just enjoying all the activity, the gorgeous color, and the great view. 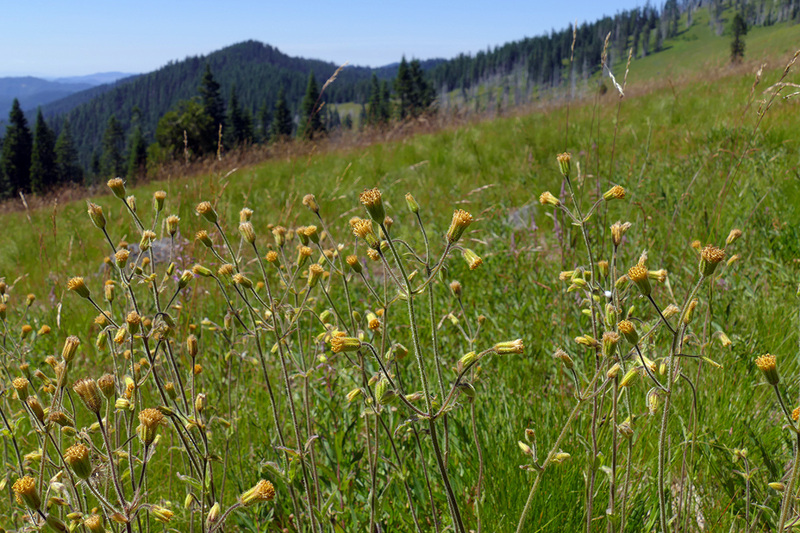 Parry’s arnica (also known as nodding arnica because of its nodding buds) is not very common in the Western Cascades, but it is abundant at Grasshopper Meadows. The most unusual sighting of the day occurred at the upper part of the meadow. I’d been chasing fritillaries all day. They seemed to be especially numerous. I caught a glimpse of a large spot of golden brown and thought perhaps it was more fritillaries mating (I wasn’t wearing my glasses so most things look pretty blurry at first). Instead, it turned out to be a sheep moth (Hemileuca eglanterina) laying eggs and being harassed by lusty fritillaries. I’d seen this once before, years ago when Sabine Dutoit and I had been at the top of Lookout Mountain in the North Umpqua. In that case, it was an orangey checkerspot who seemed to think the sheep moth was a supersized butterfly. I shared our experience with butterfly expert Robert Michael Pyle, who said he’d never heard of such a thing. Two libidinous fritillaries are overcome by the voluptuous sheep moth who is trying to lay her eggs in spite of their attentions. Here, apparently, the same thing was happening, only it was not one but two fritillaries who were so overcome by the giant similar-colored moth that they didn’t care if she wasn’t even a butterfly. I imagine she must have been giving off some powerful pheromones while laying eggs to get them so excited, but I’m not sure why that would be once she’s already mated. I watched this amazing sight for about 10 minutes and took video as well as lots of photos (still having technical difficulties posting video though). 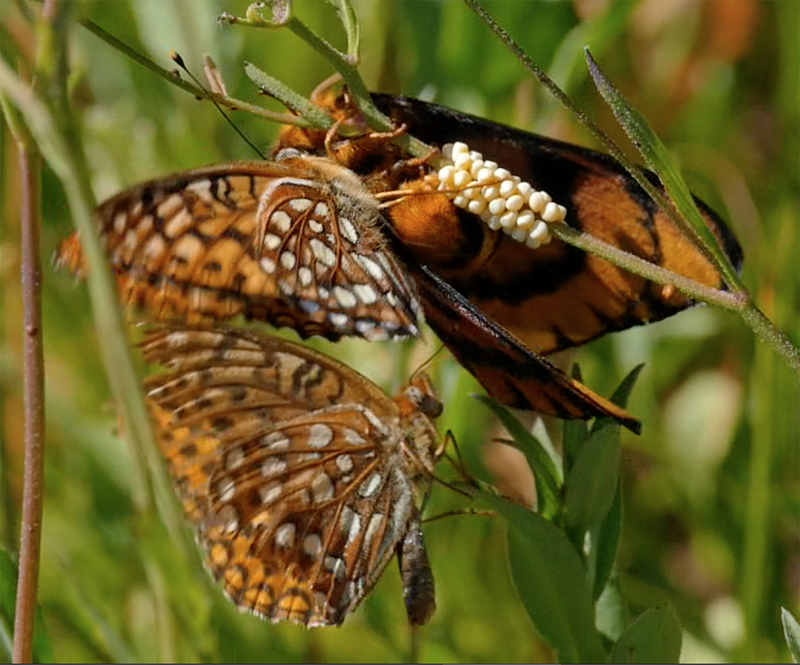 One or both fritillaries would land on her, trying hard to get into mating position. Meanwhile, she patiently laid her eggs, one at a time in a dense but orderly mass on the stem of a Scouler’s hawkweed (Hieracium scouleri), swinging her fuzzy abdomen around from one side to the other, ignoring the silly little butterflies (and me!). Then she crawled up the stem and took off, her work done. I felt very lucky to have been there at just the right time to see this unusual phenomenon once again. Lightning really does strike twice! BIG thanks, Tanya. I so enjoy your newsletters. This one surprised me, with the odd butterfly behavior ! That reminded me of something this morning – I was out picking blackberries at a patch that’s very dense, and as I was carefully reaching in among the thorny stems to get some nice specimens, I suddenly saw a whole bunch of yellow jackets in there. Startled, I withdrew my hand – then I noticed that they were all (at least 20 of them) perfectly still – and if it wasn’t for an occasional movement of an antennae or leg, they would have looked frozen. As I stood there studying them, not one of them was moving around and none were arriving or flying away. After a couple more minutes I saw one fly in to my right, and quickly landed on a leaf about a foot from the congregation – it was as though that one was a sentry and was checking me out! I backed up, and he stayed right there and didn’t try to ‘buzz’ me the way they do when you get near their nest. Then I turned to pick a couple berries and when I looked back it was not there. Then I even (carefully) picked a few berries fairly close to the group – but they were not disturbed. So I decided to not test them any further, and moved off. I’ve never seen that type of thing, and was wondering if there was a young queen in their midst and they were all staying there with her – but it didn’t make sense that none of them would have flown toward me to make me back off !